Home NewsSummer in Saint-Petersburg is a summer with AKHE! Summer in Saint-Petersburg is a summer with AKHE! Despite the tight touring schedule the Engineering Theater will show several performances in St. Petersburg. June 30 at 15:30, within the framework of the annual festival «Day of the House» dedicated to the birthday of the legendary «Pushkinskaya, 10», whose residents is AKHE, the performance «Stair of Creatures» will take place. Engineers will test the strength and fire resistance of the text of Lev Rubinstein. Free admission! July 13 at 20:00 «Monochrome» will start. The Roof Place roof was chosen as the location (Kozhevennaya line, 30). «Monochrome» is a rainbow of emotions, splashed on the snow of canvas. At the heart of the performance is the mnemonic phrase «Every hunter wants to know where the pheasant is sitting». Magical engineers Maxim Isaev and Pavel Semchenko will act simultaneously as artists and pictures. 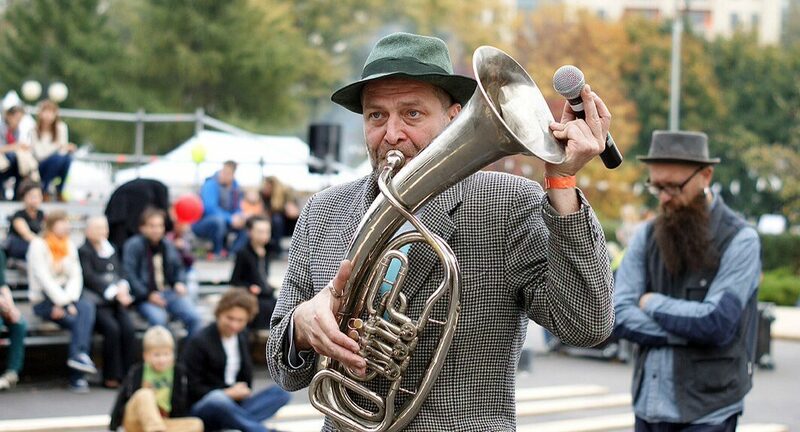 August 18 and August 19 at 20:00 on the Museum’s of Street Art territory will be a street performance «Gap filling». Several lyrical episodes told by actors and balancers, sung by boatswains and ballerinas, succumbing to the gloomy charm of their losses. «Gap» has not been played in St. Petersburg for 3 years, and this time it will be unique: the colleagues from the «KANA» polish theater will join the AKHE. Next Next post: “Gap filling” together with the Polish Kana Theatre!